Images: Stellated Dodecahedron, Tom Holiday. This, a Sacred Geometric Structure, in total accord/resonance with APOGEE Acu-Tone™... It is the Stellated Dodecahedron. It is symbolic of what I have put forth as, "COHESIVE CONSCIOUSNESS," the commune of mind to body, body to mind. This the symbolic alignment and accord of the five elements. I am privileged to possess a most brilliant crystal Stellated Dodecahedron. Kim Oleary, Crystals on the Rocks, Nyack, NY, in her commissioned quest, brought this back from her most recent gem and mineral ventures. Its celebration prevails. Its accord holds to grace, gratitude and the glory of BEING. 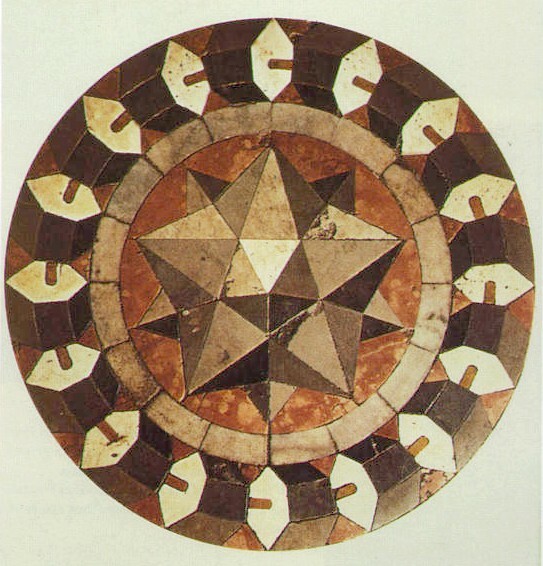 Sacred Geometry…Stellated Dodecahedron… In expression by an artist of the Early Renaissance, Paolo Uccello, 1397 – 10 December 1475. Marble mosaic showing a small stellated dodecahedron and a ring of hexagonal prisms, on the floor of St Mark's Basilica, Venice. this creates what is called the Stellated Dodecahedron. This is the form that is associated with "Christ Consciousness." Ronald L. Holt is the world director of the Flower of Life organization. He's also one of those who is truly tuned in to the Sacred Geometry of All Life Everywhere and can talk about it with passion and lucidity. Here, he describes the Christ Grid for us, how it relates to the previous grid configuration, and what this means for our future on Planet Earth. Julia: Can we start with what a grid actually is? When did the grids come into being and how do they relate to our being? Ron: In the workshop called "Seed of Life," which is our advanced FOL workshop, we look at similar questions. As far as my research goes, I found that the grids were born at the moment of the Big Bang — at the time that the Void was actually preparing for the birth of the physical universe. When we speak about the Grid, many of us are reminded of what has been depicted in some books: a matrix of angular energy lines extended above our planet. Although this representation is accurate, there is far more to the Grid than this. Grids are actually fractal and holographic. They span all of Creation, including its many dimensional levels. They are not just on Earth, but correspond to the entire Physical Universe. The Physical Universe does not exist without these Grids. The Grids appropriately distribute the life-force energy, provide the templates needed for material Creation, and much more. They are not inanimate, but are a blueprint of Consciousness itself, expressed in harmonic form. The concept of Grids is easy to understand if one has done some investigation of Sacred Geometry. For those who are new to Sacred Geometry, let me first say that Grids are expressions of energy and consciousness that follow proportions defined by principles of Sacred Geometry, and that they span the entire multidimensional universe. Sacred Geometry is the expression of geometry related to the evolution of Consciousness: mind, body, and spirit in geometric terms. True Sacred Geometry is not just about static, angular forms. It is organic and living, and in constant evolution/transcendence or devolution/materialization, ascending or descending from one form to another. So the Grid of the planet is an actual geometric and energetic expression of the principles of Creation that can serve as a bridge between our planet's physical and energetic manifestations. On Planet Earth, blueprints and templates for construction and purpose of existence are needed if the smallest particle, element, or compound is to congeal and materialize. The blueprint and template for our planet is the Grid itself. The Grid serves as a guide or blueprint around which muons, quarks, positrons, electron, atoms, and, finally, compounds organize. The Grid ensures proper distribution and alignment of the needed elemental components, which are the building blocks for Creation. It also supplies the proper distribution and alignment of life-force energy and the many frequencies needed to maintain an effective energetic phase relationship of the planet's frequency spectrum. So a stratification of Grid templates is needed for any element to form. This stratification occurs from spirit to the etheric, to the electrical, to the gaseous, fluid, and denser materials. Consciousness moves through varying gradations of density in order to affect each level, from the most sublime to the most dense. An organizing Grid is needed for each of the 108 elements in the periodic table in order to maintain order and functionality in the atomic configuration. Without a Grid template, atomic configuration would soon lose its ability to maintain self-organization. Likewise, a Grid is needed for every species of bacteria, fungus, plant, insect, animal, and mammal. In these two photos, we can see the atoms stretched across the Grid in an organized fashion. These round electrons line up to form a mandala pattern, just like a platonic solid or a combination of platonic solids. If we look at Hans Jenney's work in Cymatics, or the patterns created by sound, we can see examples of how electrons form mandalas. If you place sand on a circular metal plate that is capable of holding a musical tone, when you strike the plate, the tone causes the sand particles to form geometric patterns for each note. These are different for each note: Change the note, and you change the pattern. When we look at Masaru Emoto's work in the book The Messages from Water, or Dr. Lorenzen's work in his book Clustered Water, we can see that there are geometric patterns in water even at the atomic level. If we look closely at our 3D reality, we will see Sacred Geometry in all things. Minerals organize themselves in Sacred Geometric proportions and we can see this in most gem and mineral books, which depict the respective geometric blueprints. The planetary Grid is like a garden "trellis." The garden trellis guides vines and other plants to stretch and grow out and up across the latticework in a certain "shape." The two principal elements of a Grid are the latticework and the fabric. Both have qualities or characteristics. We could call the latticework the masculine aspect and the fabric the feminine. Both work harmoniously with each other to integrate the diversity of life. This is similar to the metal ribs and the waterproof fabric of an umbrella. The metal structure allows for the fabric to be stretched across it so its full functionality can be expressed. With human beings, can draw a similar analogy. As spiritual beings in a human body, our spiritual aspect is born of a fabric that is so all-encompassing and holographic that it is literally connected with and spans all life and all of Creation. To place the immenseness of all that into a physical body means that we have to fold up the vast umbrella of our being into a kind of butterfly cocoon and temporarily close it, awaiting the time when we unfurl our fabric and remember who we truly are. Nested and folded within all of us is an infinite expanse of fractal and holographic fabric of tremendous interconnection with all of Creation. So the Christ Consciousness Grid is the planet's version of this umbrella analogy: a fully opened fabric of Creation that keeps us connected to our origins and stimulates us to evolve forward into reunification. Consciousness Grids hold the memory of cosmic interconnectedness, thus stimulating self-actualization for those who attune to them. Julia: How would you describe the Christ Grid for those who are not familiar with the concept? Plato described the Earth as having a Dodecahedron Grid. How does the Christ Grid differ from this, and what is it, essentially? Ron: The Christ Consciousness Grid exists around the Earth and is reported by separate individuals at varying heights above the Earth. I believe that the Grid is seen at these different levels because of its holographic and fractal nature. The Christ Grid is anchored by its axis at Cairo, in Egypt, and at Moorea, in the French Polynesian Islands near Tahiti. Many of its nodal points are on the surface of the Earth. These nodal points correspond to natural energy power spots that many ancient cultures pinpointed and utilized. This Christ Grid is different from the Dodecahedronal Grid that Plato described. 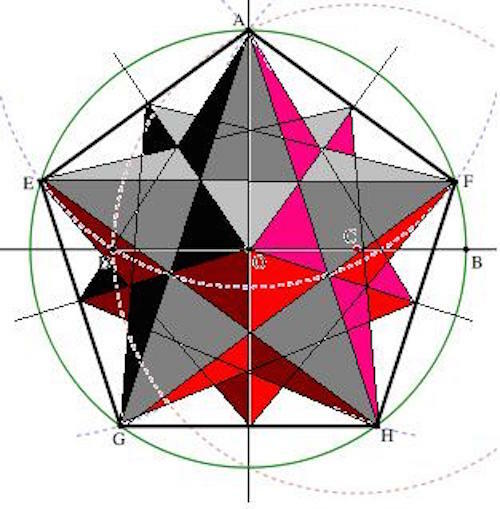 When you connect the center of the dodecahedronal pentagons with the corners, using five more lines of the same length for each of the twelve pentagons, this creates what is called the Stellated Dodecahedron. This is the form that is associated with "Christ Consciousness." There is a vast difference in consciousness and experience between the Dodecahedron and the Stellated Dodecahedron. To gain an understanding of the Christ Grid, it is necessary to look at the preceding stages of consciousness Grids and understand them. These stages are the geometric forms that precede the Stellated Dodecahedron: the tetrahedron, cube, octahedron, icosahedron, dodecahedron, and, finally, the integration of all the forms, the Stellated Dodecahedron, representing the integration of all of our aspects. 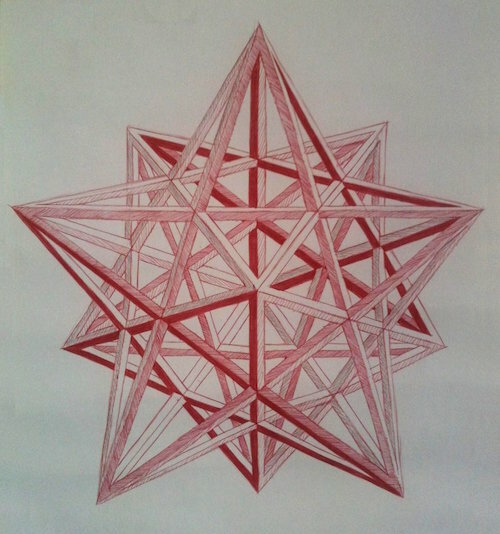 The Stellated Dodecahedron, or the Christ Grid, holds the template of all the preceding templates expressed as geometric forms. It is an expression and model of integrated completion and coherent unity of all the foundational templates. The fifth template, or the Dodecahedron, builds the foundation of the Stellated Dodecahedron. The Dodecahedron represents total surrender to Unconditional Love. This seems to be a challenge point, as many people stop here and lose their way in bliss, feeling as though there is no reason for continuing to evolve. We wanted to identify the reason for "losing the way in bliss," and we found a clue as we were constructing the Platonic Solids out of tape and equal-size plastic drinking straws. Constructing the solids in this fashion, we found that, because of the geometry, two geometric forms were weaker than the rest and had a very difficult time holding their shape or form. These two are the cube and the dodecahedron. The Dodecahedron represents Unconditional Love. Unconditional Love by itself is the sweetest blissful experience. It is a necessary step toward realizing Christ Consciousness. But however blissful, Unconditional Love is missing an important element. That element is conscious awareness or "mindfulness." I am not talking about being mentally focused. I am referring to mindfulness in the Zen Buddhist description. Mindfulness — the practice of observing one's habits, patterns, and choices — is essential to our evolution. [Note] It is easy to be melted in bliss and then become crippled and unable to be effective in the physical world. We must clearly see our selves and our level of responsibility, integrity, and impeccability in order to evolve. All of these elements are what strengthen our Dodecahedron and turn it into a Stellated Dodecahedron, enabling it to stand on its own and retain its shape. This is why the Dodecahedron was not named the Christ Consciousness Grid. The openheartedness of the Dodecahedron requires the internal support of a trinity of personal commitments — impeccability, self- responsibility, and integrity — in order to transcend into the Stellated Dodecahedron or Christ Grid. It takes the integrity and responsibility of honest self-observation and Zen Buddhist-type mindfulness to remain active and aware of whether one is in the bliss state or in the struggle of 3D reality. The Stellated Dodecahedron is about adding conscious awareness — impeccability, self-responsibility, and integrity — to the open heart to create Christ Consciousness realization. Without commitment to the higher qualities stated above, unity becomes a transitory experience that is dependant upon a leader, instead of being a natural, unfolding process from the individual level. We have all frequently observed open-hearted people who have the best of intentions falling prey to the agendas of other people or to those of their own ego. If individuals do not commit themselves to impeccability in their behavior, they fall prey to the ego agendas of themselves or others. Openheartedness without conscious mindfulness is an expression of Dodeca consciousness. The Stellated Dodeca is the consciousness of a self-realized being, and that is why it is referred to as the Christ Consciousness Grid. Christ, or any other Master of this level, exhibits this self-aware consciousness: an exceptionally high level of personal refinement that is practical and attainable for all humans who sincerely discipline themselves to attain it. It is so much more than chasing bliss. This is what is truly expressed in Christ's teachings. He didn't want anyone to follow him. He wanted us to become as he became, a self-aware, enlightened being. The Christ Consciousness Grid exists as a reminder of our true nature and encourages us to attain it. Julia: How does the Christ Grid affect our consciousness? Ron: The Christ Grid stimulates us to evolve into conscious awareness with our open heart and with high levels of impeccability and integrity. The Christ Grid also helps us integrate and harmonize a true group unity. The Christ Grid is a unified collective consciousness. This means that we are also preparing our internal templates to integrate and harmonize all of the lifetimes we spent within each culture on this planet, setting the stage to help us feel the oneness of all cultures simultaneously, without bias or prejudice. There are sub-Grids for each of the seven root races. They can be seen as seven Grid frequencies or colors comprising a rainbow of Grid lines, frequency, and color. The rainbow races are coming into aligned integration with each other as our personal consciousness continues to refine. In the past, a form of surface tension between colors, frequencies, and intentions separated us. This surface tension is diminishing as we become self-aware and self-responsible for all our actions. As we claim our personal integrity, we no longer project our lessons upon others. This reduces the surface tensions. At this time, the separation in frequencies creating the seven Christ sub-grids is aligning to become one rainbow-colored Grid. Eventually, as we become truly One, it will become a single, golden color that will eventually evolve to the diamond or crystal-clear level. The crystal or diamond children are already being born on this planet to help accomplish this. Just as we had a lifetime or more in each culture of this planet, we have also existed on other galactic worlds and cultures. Holographically, we were born into all cultures, on all galactic worlds simultaneously. The Stellated Dodecahedron is also representative of our quest to integrate and harmonize all of our terrestrial and extra-terrestrial lifetimes as a whole experience within this Creation. Julia: The Christ Grid pushes our negativity to the surface for healing and transmutation, but it is easy to focus on the issue rather than the solution. What attitudes or changes in consciousness do you recommend at this time? Ron: In terms of changes in attitudes or consciousness that would assist us at this time, let me suggest the following. Most of us have had the experience of feeling separate, alone, hurt, scared, ashamed, unworthy, or incapable. We feel this even though we have always been an expression of the complete fabric of Creation. In essence, we are already complete and perfect. All of these conditions of self-doubt are attachments that we choose and insist on holding, whether consciously or unconsciously. These attachments, and our insistence upon holding them, distract us from unfurling our holographic fabric and experiencing our true heritage. When we detach and release mentally, emotionally, and physically from whatever tensions we are holding on to, we become bright and free. This begins with detaching from the merry-go-round of mental thoughts. Developing the skill of "mindful observance" of our own self and our choices means taking steps to honestly observe our destructive patterns and making choices and actions to change them — before someone else forces us to see our own reflection in a much more unpleasant way. I recommend maintaining a good meditation practice that feels right for you, as long as it does not provide diversion or entertainment away from your own inner self. Deep heart-opening exercises that appeal to you, and especially those that take place in nature, can take you deep enough into the heart to help you release agendas and ego. I am currently creating a meditation series on CD for the purpose of deepening the open-heart experience in nature. This can provide a deep, experiential reverence for all life where one experiences absolute oneness, and many of the concepts we have discussed become known by the heart instead of understood by the head. Julia: There seems to be a magnification of energy at this time — whether harmonic or disharmonic. How does this work in relation to the Christ Grid? What can we do about it? Ron: It has been stated that the Earth is waking up from the Kali Yuga and is transitioning into a period of heightened frequency. It also has been said that the Earth is raising its resonant vibration. People are experiencing these heightened frequencies and responding to them as best as they can. Many people are also awakening to their Spirit and tuning to the higher levels or possibilities that also increase the mass frequency and the consciousness level. This creates a wave effect through humankind, serving to stir the pot of awakening and focusing our attention upon what really matters. As the frequency rises, it is experienced by whatever polarized aspects within us — negative and positive — we have not yet integrated into unity. Some people resist the internal pressure of our unresolved personal issues that need to be processed. These issues will continue escalating if they are not addressed, especially as the planetary frequency rises. Often, individuals might then choose to react by acting out and projecting their issues externally upon other people or world situations instead of truly addressing them internally. The only effective manner I know that can help us handle this increasing pressure is to learn to respond to it instead of reacting. Responding is conscious, and reacting is unconscious. Responding to the pressure means being mindful of our personal habits and patterns and not being afraid to see our dark sides. This helps us learn to carefully choose our actions — mentally, emotionally, and physically. Sometimes this takes time and patience. In relationship to the Christ Grid, the higher levels of life have always made their frequencies available to everyone at all times. After all, they are us in another form! As we awaken to a higher sense of purpose and action, we naturally and eventually attune to higher Grid levels until we reach the Christ Consciousness Grid and awaken the Christ Consciousness within us. Life attempts to stimulate us to achieve our highest potential. Julia: I get that focusing on the light and its vibratory rate can aid in clearing negative mental or emotional states. Is simply focusing on the 5th dimension a solution for "being stuck" that many people seem to be experiencing right now? Ron: The sensation of being stuck is really a state of being unaware that one is choosing to hold onto an issue rather than release it. This is easily said and harder to realize in practice. We all do this, and we would be best served by practicing detachment and release in the area needed, whether it be the realm of the mental, the emotional, or the physical. We attain the highest levels of our potential when we release totally and become absolutely "nothing," mentally and emotionally. The Buddhists say, "When we become nothing, we become everything." In this detached state, there is still a keen sense of awareness and focus, but it is different, and it is much more rewarding because you become more of your true self. So the disciplined practice of detachment from the busy-mindedness or the state of unbalanced emotionality, drama, and neediness is highly effective in bringing absolute peace and harmony. The practice of impeccability and the mindfulness of one's actions, words, and choices is Christ-Consciousness-Grid-level work — work at the level of the Stellated Dodecahedron — and it will lead to the spiritual development and clarity that most are seeking. Focusing upon a "higher dimension," like the 5th, can often be used as a way to escape the challenges of physical evolution — placing one's attention upon an external idea. What is truly needed, instead, is a clearer focus upon one's own inner choices, patterns, and actions. Julia: Are there changes that will occur in the DNA because of the Christ Grid? Ron: Absolutely. And that has been happening for a long time now. Each step we take in our own personal integration and evolution is being written upon our DNA while being reflected around us in our reality. This allows us to tap into more frequency bands of consciousness, thus raising our awareness. The more we clear ourselves, integrate, and progress, the more we activate our DNA packages. And that, in turn, helps us reach our full potential as individuals and as a planetary species. Julia: Will the changes in consciousness cause movement in the Tectonic plates? Ron: They could. In fact, the movement of tectonic plates is often really just a reflection of our consciousness as a species. Usually, it has to do with what we are resisting rather than what we are embracing. If you ponder this, I think you will find some interesting insights. Ronald L. Holt is the director of the Flower of Life organization, which was passed on to him by Drunvalo. In April 1997, Drunvalo appointed him president and CEO of Flower of Life Research and gave him full authority to act on behalf of Flower of Life in all matters. Ron became the Worldwide Director in 1998. A spiritual seeker for most of his adult life, Ron has been a Flower of Life facilitator since 1993. He worked overseas, primarily, and was the first to bring the Flower of Life workshops to Japan, Hong Kong, Thailand, South Africa, and Australia. Before becoming involved with the Flower of Life, Ron's diverse background included work as a marine and field archaeologist in Hawaii and Guam. His interests throughout his life have included martial arts, spiritual study, landscaping, travel, and much more. Ron lives in Phoenix with his wife, Lyssa Royal-Holt, and oversees the Phoenix FOL home office. He is committed to creating the Flower of Life organization to be one of lasting integrity that presents teachings to enrich the human experience and help us reawaken our memories and connection to the Divine Source of All. For more information, please visit the Flower of Life website. Note: Ron recommends learning and developing skills in detachment and release, and advises that any number of Eastern-style teachers, as well as martial arts programs, can provide training in this. For those who like intellectual stimulation to help them release attachments, he recommends reading such books as Eckhart Tolle's The Power of Now and Osho's The Diamond Sutra,as well as Neale Donald Walsch's Conversations with God and Lyssa Royal's Millennium: Tools for the Coming Changes. Wondrous... Newly emergent rainbows in a Stellated Dodecahedron... blessed be this accord of light and spirit... ascension's glory known.